Cork flooring is quickly growing in popularity amongst people and families that are interested in minimizing their carbon footprint. This is largely because this type of flooring is extremely resilient and it’s also very eco-friendly. While most people have just recently become aware of cork’s application as a viable flooring alternative, many are unaware that cork has been employed for the purpose of flooring since all the way back in the 19th century. Most of the cork that is utilized to manufacture cork flooring is either hand-harvested or naturally shed bark from the cork oak trees that grow predominantly in the Southern Europe region. Most places enforce strict regulations to ensure that the cork oak trees are left unharmed during the harvesting process. A well cared for, healthy cork oak tree can live for up to 500 years. While cork is certainly one of the flooring industries more useful options, it is far from perfect. When you’re shopping for new flooring material, it’s important for you to explore the pros and cons of many different options. 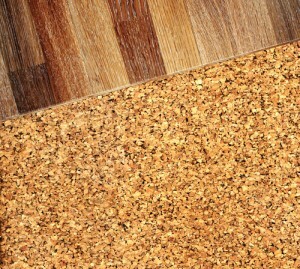 Cork is one of the more resilient flooring options available on the market. It withstands heavy foot traffic very well and its’ naturally spongy quality provides a more cushioned walking surface that you’d find with other hardwood, laminate, or tile flooring options. Cork flooring is also naturally resistant to many invasive organisms, as well as mold and mildew. It’s also one of the more hypoallergenic flooring options available today, which makes it an excellent choice for individuals or families that suffer from allergies. Cork flooring also stores warmth better than many other types of flooring. This is primarily because of its’ cellular nature. This cellular nature also allows it to act as a natural sound barrier and insulator in areas of your home that suffer from echoes. In comparison to other types of flooring, cork can actually be quite expensive. The cost is often driven up because a professional with experience handling this material must install cork flooring for you, which drives up the cost of ownership for this product. While some homeowners will love cork flooring for its’ “bounce-back” quality, others will find that it doesn’t hold up to heavy furniture being placed on it for long periods of time. Cork flooring can actually become permanently indented if you do not employ furniture pads to reduce the strain on the floor itself. Cork flooring can also be more light sensitive than other types of flooring. If you decide to install cork floors in an area of your home that sees plenty of direct sunlight, you might find that the cork will gradually change color over time. Cork can be an excellent flooring choice for your home if you install it in areas that meet its’ specific strengths and weaknesses. Homeowners should be careful to consider all the pros and cons of this product before settling on it as a final choice for any given room in their home.